When it comes to the most powerful supercomputers in the world, I don't think it is to anybody's great surprise that the most powerful one is located in Japan. This new Japanese supercomputer has just recently earned the top spot among all the supercomputers in the world with a performance that makes other supercomputers look like a TI-82. Known as the "K Computer", this device is three times faster than its closest rival from China, which previously held the number one spot, according to Professor of Electrical Engineering and Computer Science at the University Tennessee at Knoxville Jack Dongarra. Dongarra also keeps the official rankings of computer performance. The K Computer, which was created by Fujitsu and is located at the Riken Advanced Institute for Computational Science in Kobe, Japan, represents an incredible step forward in the realm of speed. This computer will also, more than likely, become a great sense of national pride for Japan, especially for computer scientists, who take the race to have the fastest computer in the world very seriously. According to Dongarra, "It's a very impressive machine. It's a lot more powerful than the other computers." The latest ranking of the top 500 computers is determined with a simple mathematical equation. The computer who gets to take the top spot is able to make 8.2 quadrillion calculations per second which also calculates to 8.2 petaflops per second. The performance of the K Computer is the same as linking around 1 million desktops. Supercomputers have many uses including earthquake simulations, climate modeling, nuclear research and weapons development and testing. Businesses also use supercomputers for oil exploration as well as rapid stock trading. However, building a supercomputer isn't cheap and it usually involves connecting thousands of small computers in a data center. The K Computer is made up of 672 cabinets filled with system boards. The K Computer is considered to be energy-efficient even though it uses enough electricity to power around 10,000 homes at an estimated cost of $10 million annually. I'd hate to see the statistics for the non-energy-efficient ones. The lab that the K Computer calls home is planning on increasing the size of the computer to 800 cabinets which is predicted to raise the speed of the supercomputer that is already faster then its five closest competitors. 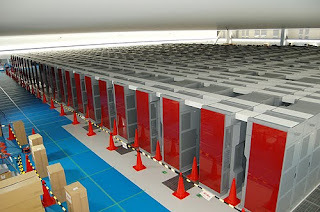 The K Computer received its name from the Japanese word "Kei" which translates to 10 quadrillion, the overall goal for the number of calculations the supercomputer should be able to perform. The previously leading supercomputer was China's Tianhe-1A which was located at the National Supercomputing Center in Tianjin, China. The Tianhe-1A was the first Chinese supercomputer to hit the top spot which acted as a beacon of the country's growing technological prowess. The fastest supercomputer in the United States is located at the Oak Ridge National Laboratory in Oak Ridge, Tennessee. It placed third behind the K Computer and the Tianhe-1A. Countries in Asia have made sizable investments in supercomputing and currently dominate the upper echelon of the field. Japan and China alone hold four out of the top five spots. However, when it comes to the top 10, the United States is still the leader, holding five of the top 10 spots. Japan's top supercomputer ranking marks the country's first since 2004. The United States and China were previously the only countries to hold that title. These rankings, issued every six months, are frequently changed and reflect just how fast computer power is advancing. Most business class projectors will do a good job displaying your PowerPoint presentation. If you have a small presentation group, a 2000 lumen LCD projector will be able to produce a nice and clear picture. For larger audiences you should consider a 5000 lumen LCD projector.